Are you finding it difficult to provide high levels of customer service that credit unions are known for? Are you forced to increase manpower and infrastructure resulting in higher overheads to match the increased workload? Then outsourcing mortgage processing support services is the best option for you! We, at Outsource2india, can provide you with the best quality mortgage processing support services which will relieve you of all the lengthy and time-consuming processes. Our mortgage loan processors can determine the feasibility of granting loans by following the lending approval matrix and credit union policies. Mortgage loan processors gather and verify loan applicants' financial data and validate details of titles held and follow state and federal regulatory guidelines at every step. Outsource2india's loan underwriters then step in and perform a detailed credit analysis of the loan applicant to verify if a borrower's financial ratios meet the bank's lending standards. The major reason for the delay in mortgage processing is due to the delay in collecting all the relevant documents. 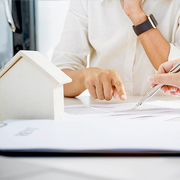 Our team members who are experienced certified mortgage professionals are familiar with the current regulations and ensure that all loans comply with state and federal rules and understand exactly what documents are needed for smooth mortgage processing. Our services have stringent review processes in place that follow industry best practices to protect the credit union from both clerical errors and major compliance issues. We provide quality assurance that guarantees a high level of accuracy with meticulous screening for errors and non-compliance to regulatory guidelines. Our team of mortgage experts has the required expertise and skills to provide in-depth client data verification services. This ensures that all the data is accurate and provides the client with a smooth mortgage processing experience. We can help you streamline your mortgage processing. At O2I, we start by studying the credit union's mortgage process. We then document all the steps so that our in-house team can follow the same processes and systems. Next, our transition team study the process and list out the inefficiencies in the customer's processes. After seeking approval from the client to replace these inefficiencies with better processes, we implement the solutions. Why Outsource Mortgage Processing Support to Outsource2india? When you partner with us, our team is your team. The team size can be scaled up as the work picks up or scaled down when the workload is low. You can benefit from better resource usage and reduce your spending on infrastructure. In addition, quick disbursement of loans helps credit unions keep their operating costs down while increasing profits. Our mortgage processing support team know the exact sequence of steps that will get the loan processed quickly. They take care of all the compliance issues so that there are no violations that could lead to delays. You will liaison with a one-point contact who will help you at every step. In addition, you will have 24/7 access to our services so that you are aware of every stage of the process. In order to protect sensitive and confidential information, our team members undergo regular training sessions on cyber and data security best practices and are aware of new and evolving threats. You will have 24/7 access to our services so that you are aware of every stage of the process. This ensures that you will have complete control over the mortgage process. We provided mortgage processing support to a prominent residential mortgage lender with an average closing period of two or three months and was unable to process loans quickly. Thank you for the meeting today. I wanted to pass along my gratitude to your team for helping with these files. My team and I appreciate your continuous assistance and hard work. You make a great impact in our daily process, and it does not go unnoticed. Please let us know if you need anything! Thanks. Outsource2india is your answer to high overheads, loan processing delays, and regulatory compliance issues. Whether the delays are due to necessary paperwork not being provided by the borrower, or delays in closing because of title-related problems or because of under-appraisal of the property, we have the answers. We have over a decade of experience in providing mortgage processing support for credit unions and series of other mortgage services. The services we provide includes Residential Mortgage Loan Services, Renovation Loan Mortgage Services, and reverse assistance services. We assure you of high-quality mortgage processing support services with a high degree of accuracy and compliance to state and federal regulations. We also provide Fixed Rate & Adjustable Rate Mortgage Loan Support Services, reverse assistance service, conventional loan processing services for mortgage, mortgage processing support for credit unions, mortgage closing support and more. Let us take care of processes such as title-search, property appraisal, and credit checks for you. Let your loan officers focus on providing the high levels of customer service that credit unions are known for.